A foreigner living in Japan making steady progress towards a successful career in business has been ruthlessly heckled by a horde of raucous English teachers. 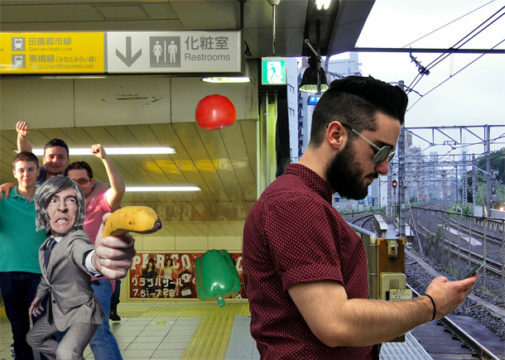 Ryan Cox was standing on a Tokyo train platform engaging in a lucrative business text message when he was suddenly pelted by an extensive range of imitation foodstuffs. “I’m just about to finalize an incredible business deal on my phone as I’m struck by one of those artificial tomatoes,” said Cox. Cox could sense a deep-seated contempt by the sheer range of plastic fruits and vegetables being hurled in his direction. The English teachers split into groups of five and formed lines taking it in turns venting their anger towards the successful gaijin. “I could really feel the resentment after a fairly weighty toy eggplant just missed my left eyeball,” said Cox. A rift eventually began to form between the “superior” JET teachers versus the “other” teachers within the restless TESOL gang who were mostly on underpaid one-year contracts, allowing Cox to make a quick getaway and avoid serious harm.